Singapore, 31 July 2018 – Surbana Jurong, Nanyang Technological University, Singapore (NTU Singapore) and the National Research Foundation Singapore (NRF) have set up a joint corporate laboratory to develop next-generation sustainable solutions to tackle industrial and complex urban challenges. It will include research to explore underground storage systems, sustainable indoor solutions for buildings, and digital technologies to scale up productivity in the built environment. The $61 million joint corporate lab is underlined by a five-year partnership, which leverages NTU’s strengths in engineering and sustainability research, and Surbana Jurong’s track record in providing urban, infrastructure and industrial solutions to its global customers. 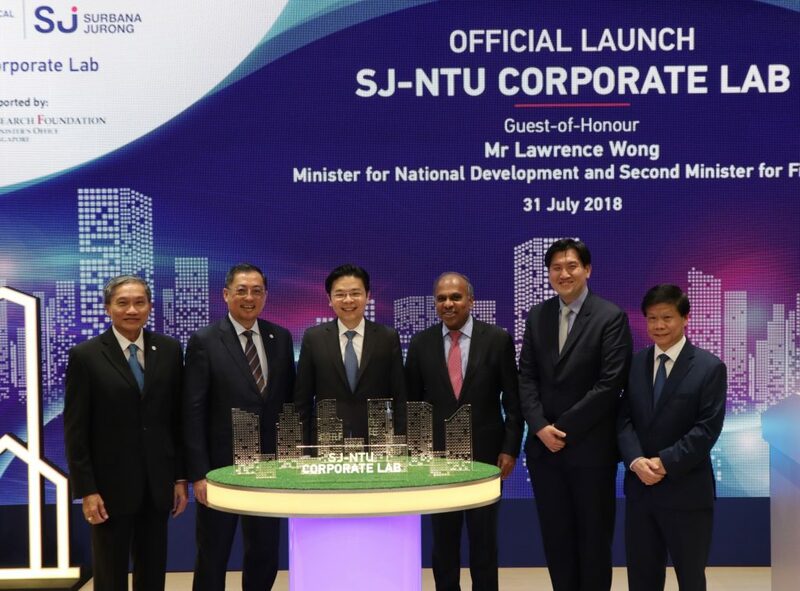 Located at NTU, the SJ-NTU Corporate Lab was officially launched today by Mr Lawrence Wong, Minister for National Development and Second Minister for Finance. The NRF facilitates the setting up of corporate labs via public-private partnerships. The SJ-NTU Corporate Lab is the 12th supported by NRF and the sixth such corporate lab at NTU. NTU President Professor Subra Suresh said, “The current dramatic shift to a digital and sustainable economy requires societies to push the boundaries of urban and industrial innovation, and develop new technologies that balance the built and natural environments. The key objectives of the SJ-NTU Corporate Lab will be to translate research outcomes into practical and viable solutions that are focused around three core themes: digitalisation; green and sustainable urban solutions; and future of the industry and productivity. Kicking things off, researchers will be working on 11 projects that are aimed at optimising land usage, future-proofing buildings and infrastructure, and transforming the way buildings are designed and constructed. For example, researchers will develop a thermal management system and an indoor air quality system that is not only energy efficient, but also uses a botanical solution to purify the air. Integrating selected plants with architectural and interior design, indoor air pollutants would be reduced while creating a natural and lush indoor environment. Another project involves a chilled ceiling technology that uses special composite materials for ceiling panels which are linked to a central monitoring system. The composite panels transfer heat more effectively than conventional aluminium panels, reducing the need for air-conditioning and improving energy efficiency. On the digital front, researchers will look into creating technologies to scan and map the external and internal parts of building structures such as piping networks, to create Building Information Models. The solution aims to improve the efficiency of facility managers and change the way buildings are managed and maintained. For a start, researchers will explore underground storage spaces for storing liquefied natural gas (LNG) in industrial and urban areas so that space aboveground can be freed up for other uses. The storage of LNG within these spaces will be kept at below 162 degrees Celsius to ensure it remains in a liquefied state. Asia’s first ‘Cold Lab’ that will develop ‘Cold Energy Capture’ and ‘Cold Energy Storage’ technologies will also be set up. These technologies harness cold temperatures produced during regasification, a process where LNG is converted back to natural gas at atmospheric temperature. The harnessed cold energy could power various industrial applications such as cooling systems in warehouses and data centres. Surbana Jurong is one of the largest Asia-based urban, industrial and infrastructure consulting firms in the world. Leveraging technology and creativity, Surbana Jurong provides best-in-class consultancy solutions across the entire value chain of the urbanisation, industrialisation and infrastructure domains. Headquartered in Singapore, the Surbana Jurong Group has a global workforce of 14,000 employees in more than 120 offices across over 40 countries in Asia, Australia, UK, the Middle East, Africa and the Americas, and an annual turnover of around S$1.5 billion. Surbana Jurong has a track record of close to 70years, and has built more than a million homes in Singapore, crafted master plans for more than 30 countries and developed over 100 industrial parks globally. The National Research Foundation (NRF) is a department within the Prime Minister’s Office. The NRF sets the national direction for research, innovation and enterprise (RIE) in Singapore. It seeks to invest in science, technology and engineering, build up the technological capacity of our companies, encourage innovation by industry to exploit new opportunities that drive economic growth, and facilitate public-private partnerships to address national challenges.